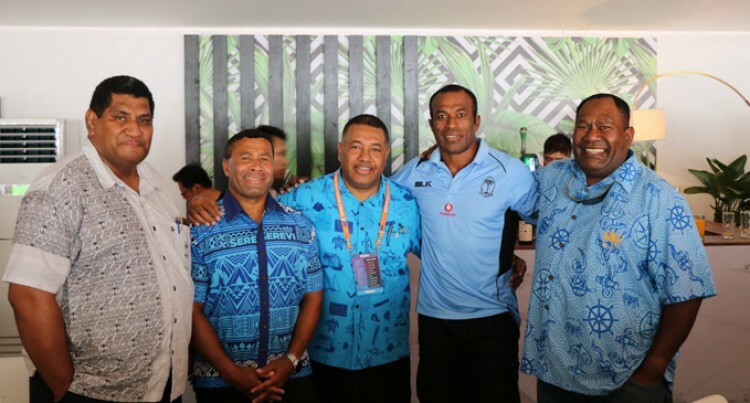 From left: Fiji Rugby Union CEO John O’Connor, Waisale Serevi, Gabby Abariga, Sireli Bobo and Ben Nawaqavou at the launch of the FijianRaka Media’s logo and chant for the Fiji Airways Fijian 7s team in Hong Kong on April 6, 2018. Photo: FijianRaka Media. The chant was composed by Dubai-based FijianRaka Media who also used the occasion to launch their new logo. Speaking to SUNsports, FijianRaka Media’s Gabby Abariga said they had notified Fiji Rugby Union board chairman Francis Kean and chief executive officer John O’Connor. “Our appreciation also goes to Waisale Serevi for allowing us to do the introduction,” the former Suva based- musician said. Abariga said Kean and O’Connor were briefed of their proposal to have a composed Fijian chant. “The chant can be played every time Fiji scores a try instead of the normal ‘Simply the Best’ tune from Tina Turner and other English music tracks that have been part of World Sevens Series for the past many years. Abariga said they are grateful to Solo Komai, Etu Baravilala and Roy Evans for starting the famous ‘Toso Viti Toso’ (Go Fiji Go!) chant during the 2016 Rio Olympic Games. “That was enough to inspire me to add the lyrics Me Dua tale Mada meaning ‘One more try please Fiji’. “I would like to thank my Fijian musical brother Henry Cork for putting the major tracks together in just two days. Abariga said the tracks have been emailed to Hong Kong Rugby Union chairman Peter Sachts requesting for his facilitation to have the chants played from the quarterfinal onwards.